The Andrew W. Mellon Foundation, which supports humanities, culture and the arts in higher education, has appointed nationally acclaimed poet and scholar Elizabeth Alexander as its president. Alexander, who succeeds Earl Lewis in the position next month, has blended creativity and art with academic leadership. Her poetry has been recognized from the White House to the halls of Ivy League institutions at the same time that she has built a reputation as an administrator with strong management skills. Her memoir, Light of the World, was a finalist for the Pulitzer Prize in Letters and was former First Lady Michelle Obama’s favorite book of 2015. 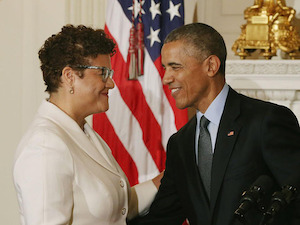 Elizabeth Alexander with President Barack Obama. Meanwhile, Alexander spent 15 years on the faculty of Yale University, where she served as a professor and chair of the African American Studies Department. She also was director of creativity and free expression at the Ford Foundation. In a phone interview with Diverse, Alexander said she has embraced all of these roles — as a poet. Many will be at Mellon, Alexander said. She will lead the foundation in drawing in new partners to support the arts and humanities and in “refining the foundation’s distinctive blend of a commitment to the arts and humanities for social purposes and for their own sake,” according to the announcement of her appointment. She served as director of the Poetry Center at Smith College and taught for seven years at the University of Chicago. Alexander also taught in New York University’s graduate creative writing program and in 2015 joined the faculty at Columbia University as the Wun Tsun Tam Mellon Professor of the Humanities. Alexander received a Ph.D. in English from the University of Pennsylvania, M.A. in English from Boston University and a B.A. in English from Yale. She has authored six books of poetry, including American Sublime — a finalist for the 2005 Pulitzer Prize – and two collections of essays, The Black Interior and Power and Possibility. According to its website, the Mellon Foundation’s total endowment, as of December 31, 2016 was just over $6.2 billion. The foundation had awarded grants totaling nearly $287.3 million in five core program areas: higher education and scholarship in the humanities; international higher education and strategic projects; arts and cultural heritage; diversity and scholarly communications.